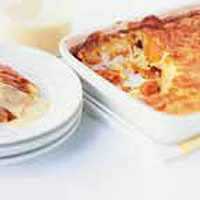 This is a classic batter pudding, made here with apricots and served with an apricot syrup or a zesty orange custard. Preheat the oven to 190°C, gas mark 5. Drain the apricots, reserving the juice, and place, cut side up, in a buttered shallow ovenproof dish, about 20cm wide. Scrape out the seeds from the vanilla pod and place in a pan with the empty pod and the soya milk. Bring to the boil, remove from the heat and leave to infuse for 5 minutes. Meanwhile, beat the eggs and sugar in a bowl with an electric handwhisk until pale and fluffy. Fold in the flour. Remove and discard the vanilla pod, then gradually stir the soya milk into the egg mixture to make a smooth batter. Pour the batter over the apricots and bake for 35-40 minutes until risen and set. Meanwhile, place the reserved apricot juice in a pan and cook over a medium heat for 8-10 minutes until reduced by a third and syrupy. Dust the pudding with icing sugar and serve drizzled with the syrup or the orange custard. The batter improves when rested or relaxed like pancake batter. Make as directed and chill for up to 30 minutes at the end of the second step. Use other canned fruit, such as peaches, cherries or plums, instead of apricots.